The first thing you need to know is if you really need an appraisal. According to the ASA an appraisal is a written or oral report which communicates value. A formal appraisal report is a legal document that presents a reasonable argument for the value of a piece of property. The appraiser must be confident enough to defend his or her findings in a court of law. An appraiser who is trained and capable of preparing such a report charges rates similar to that of a lawyer. The reasons for this is because, much like a lawyer, the research and writing required is abundant and time consuming, not to mention the required education and expertise for such work. If you do require an appraisal report you will be presented with either a letter of professional opinion or a formal appraisal report. Each appraisal must have a specific purpose and type of value assigned to it. Please do not hesitate to contact me if you need these services. Even if you are not sure if you need an appraisal we can discuss what you do need. 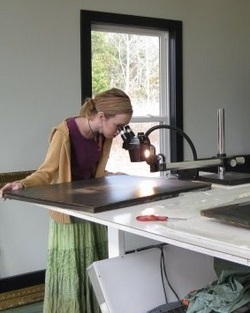 Amy, during college, interning at Crawford Conservation Inc.